Uwe Reckzeh answers. Almost three years ago, the Westphalian musician published his last work in Berlin School Style with "Surreal Dreams". One preliminary: When recognizing his current 2018 album "Surreal Dreams" ever full score. Reckzeh's style is inimitable. Nevertheless, fans will discover many new features. "Surreal Dreams" is more musical. It could also be said that it is more human. This makes "Surreal Dreams" less perfect than "Surreal Dreams" and that's exactly what makes this new album different. It seems that Reckzeh's new music is more random. This is not only nice but also very exciting. You never know what will happen next. Nevertheless, the entire album retains its "flow". Nothing is "perfect" down to the last detail. Corners and edges are desired. Chaos and order are directly opposite. In interaction, all 7 tracks seem to be from one piece. This "Surreal Dreams" is supported by a maximum of varied monotony, as only Reckzeh mastered. 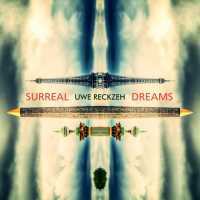 With "Surreal Dreams" Uwe Reckzeh once again succeeded in creating an extraordinary and special album in Berlin's school style, which stands in clear contrast to the countless 08/15 breakfast productions. Is not it the un-perfect thing that makes things special? This is fresh Berlin school in perfection. Uwe Reckzeh is part of this category of discrete artists who come and go, leaving behind works that make us regret the big gaps of time between each album. Except that sometimes the wait is worth it! Some 3 years after the release of Perfection Mode, Uwe Reckzeh comes out of his mutism to launch another striking album. On solid rhythms and on evolutionary mode as well as with arrangements always very stylized, “Surreal Dreams” takes again where Perfection Mode had stigmatized its footprints between our ears. Either with a kind of concept album where the phases of electronic rock and Berlin School inspired by the 80's and 90's of Tangerine Dream are pouring in with an always melodious approach from the Nordrhein-Westfalen musician. A superb album where the guitar and the synth are the kings of an electronic universe to the size of its possibilities. The noises come from far away. It looks like a pile of chains breaking the last bones in a hubbub of clamor. A bass pulsation redirects our attention by structuring a bouncy and lively rhythm to which are added percussions which are always as effective as the sequencing patterns in the universe of Uwe Reckzeh. Synth riffs lay down the beginnings of a nascent melodious approach, while other riffs of an electronic guitar reaffirm the Dream influences on the territory of “Surreal Dreams”. Synth lines make singing these electronic birds whose songs coo on a structure weighed down by guitar riffs always a little more powerful. And behind all these clamours, these initial sounds and these structural elements in place, "Surreal Dreams Part I (Science)" takes off in the skin of an electronic rock which takes advantage of the brief moments of hesitation between the phases of its development to oppose good solos of a six-strings vociferating of heavy and weighty riffs to sequences disguised as bells and of which the tinklings of ice disarm as much as enchant. With this tendency to constantly adding elements of surprises in his structures, Uwe Reckzeh intoxicates our ears with a sonic cornucopia which will seduce in many places on his last album. In its suit of mid-tempo seasoned of crystalline tones, "Surreal Dreams Part II (Visions)" offers a more tempered approach. The scenery is almost surreal with these guitar chords as limpid as drops of water frozen in nitrogen which tinkle as if they were softened by an elegiac xylophone effect. Good electronic arrangements and pads of absent voices give a depth without pitfall to a bounding rhythm which welcomes this frosty melody. A rhythm forged on this fusion of sequencer and electronic beat-boxes to which many filaments of sequences grow and crawl in a structure which offers a final closer to the usual lands of electronic rock soaked in a Berlin School revamped. "Surreal Dreams Part III (3 Spheres)" follows with a fascinating introduction that propels us into the time of nightclubs where the singers also sold cig a rs. The structure becomes more lively when supported by a meshing of sequences, focused on bass pulsations, and of sober percussions which welcomes a good other melodious approach sculpted by a synth dreaming of the Martenot waves. This synth, and its zigzagging waves, and the arrangements make me think of the good Edgar Froese's Stuntman era. The pace advances, then it stops! It's going on the trail back? It stops again. And each time it feeds the basin of its moods with good arrangements and riffs that fill our eardrums. They also fill the borders of its harmonies with good synth solos loaded of vampiric aromas and finally the depth of its rhythm with more sequences which, paired to the riffs, give a more electronic rock luster to this title in search of its mutations. Built in 3 stages, "Hydrothermal Springs Part I to III" is a superb title. This is the cornerstone of “Surreal Dreams” with a very rockish first phase. A second one in Berlin School mode, in what is nobler, and finally with a mid-rock / mid-Berliner. These phases of rhythms, pleasantly constructed on brilliant visions of the sequencers, transit between brief ambiospherical passages before returning to another form. The arrangements and the electronic decor is dense and splendidly covered with thin lines of harmonies which fly all over this album with tunes of guitar and of synth which sometimes whistle some catchy solos. A huge electronic rock with a good theatrical dose, "The Real 911 (Alternate Rules)" stands out with its very personal imprint. The synth launches Arias whose sung melodies flirt with Arabian perfumes, in addition to feeding our ears of good and very acrobatic solos. The rhythm is still in evolutionary mode, there are even some more baroque phases here and there, with effects of reverberations and echoes in its opening before falling into a good electronic rock. The drums are unleashed on this title while the sequencer, very nervous and feverish, oscillates its lively and hungry keys in a video game scenery. "Surreal Dreams Part IV (The End)" offers a delicate introduction marked by the presence of a piano which traces a more acoustic melodic pattern. The rhythm is of a motionless nature with a sequencer in a mode compulsive pounding key, while the percussions are clubbing the ambiences caulked of tenderness. More melodious than melancholy, the piano disperses its notes in the caresses of a synth and of its solos with tones as spectral as the Martenot waves. The continuous pulsation of the sequencer and the disguised solos arise memories of a Vangelis in great shape in his Antartica period. These solos capture moreover the vibes of “Surreal Dreams” from the very beginning. So nothing more normal that they invade the territories of "Surreal Dreams Part V" which finishes this last opus of Uwe Reckzeh with elegance and without complexity in the intersections of the textures in the melodies and in the moods, while the rhythm remains stoic in its electro n ic envelope carved on a sequencer as sober as the percussions. Sometimes the results justify the expectations. This is exactly the case of this “Surreal Dreams” from Uwe Reckzeh. A great album without burrs that continually amazes over the course of his Discovery.